A poor young man finds a magic lamp that possesses a genie, who will grant the boy three wishes if he sets him free from the lamp. After failing to be re-elected, politician Blake Washburn returns home and becomes editor of the local newspaper. When he notices the influence the paper has on the public, he uses it to appeal to potential voters in the next election. Two gunmen, a Native American con-woman and a sadistic priest-turned-crime lord alternate between fighting and aiding each other over obtaining a treasure map that will lead them to buried gold. A drifter helps a ranch couple fend off the approaches of a ruthless landowner. Two decades before she would gain fame and some fortune as Alexis Carrington in television's Dynasty series, Joan Collins starred as Esther in this melodramatic, routine Biblical story. The setting is Persia in the 4th century BC, as Esther comes to the attention of the recently widowed King Ahasuerus. The king has been trying to stifle and defeat the campaign of hatred fomented against the Jews by his evil minister Haman (Sergio Fantoni). Before the King can pair off with Esther and defeat the villainous Haman, there are several intervening adventures and an additional, attractive woman who competes for attention. Narrator: The time is 2,500 years ago. The place is Persia. The man is Ahasuerus, king of the Medes and the Persians, ruler of 127 provinces, the most powerful man on Earth. The army is the conqueror of all the lands from India to Ethiopia. They are returning home now from fresh victories in Egypt. ¨The power , the pageantry , the sweep of one of the greatest love adventures of all¨ . Biblical costumer with the hunk Richard Egan as the great Persian king , statesmanlike as well as conqueror ruler , and the gorgeous Joan Collins as Judean maid , the young Jewish girl , Hadassah , goes on to become the Biblical Esther , the Queen of Persia , who saves the Jewish nation from annihilation at the hands of its archenemy , Haman . As the stiff king wants to her in place of the murdered queen , Daniella Roca . 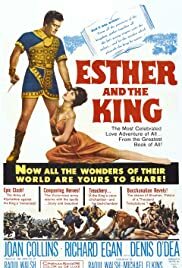 The movie is partially true to the Biblical account of a Jewish woman who , at the risk of her own life, stands up to the King and a man named Haman , Sergio Fantoni , who was almost successful in convincing the king to wipe out all of the Jews in the land . In the Bible, one of the best lines is spoken by Mordecai , played by Denis O'Dea , Esther's uncle , who tries to assuage Esther's fear by saying, "Who knows, perhaps you have been chosen for such a time as this" . It was written : ¨Gather together all the fair young virgins unto the palace and let the maiden which pleased the king be queen¨ . In the end , Haman constructed a gallows from which to hang Mordecai whom he insisted was subversive , but things go awry . This long epic Italian/USA co-production shot in Cinemascope and color by De Luxe well photographed by Mario Bava . Evocative and moving musical score by Angel Francesco Lavagnino . The motion picture financed by Galatea Production and realised by Twenty Century Fox Corporation was professional but middlingly directed by Raoul Walsh . Raoul was an expert on action , thriller , Film Noir , Western genres . He made several adventure/epic movies as ¨Blackbeard pirate¨, ¨Sea Devils¨, ¨Captain Horacio Hornblower¨, ¨The world in his arms¨ and this ¨Esther and the king¨ and at the same time collaborated , but uncredited , in ¨Helen of Troy¨ by Robert Wise .